Brad Wall says his farewell as Saskatchewan’s premier at the 2018 Saskatchewan Party Leadership convention. 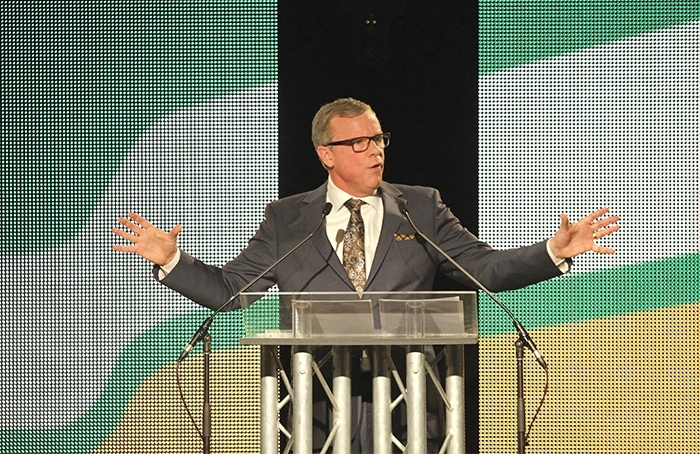 With pipeline rallies and convoys erupting across the Prairies and a pro-resource rally coming up in Moosomin this Saturday, World-Spectator editor Kevin Weedmark spoke with former Saskatchewan Premier Brad Wall last week about pipelines and whether there is a future for a project like the cancelled Energy East. As you know, Moosomin would have played an important role in Energy East had it proceeded, with a 1,050,000 barrel tank farm at the Moosomin compressor station and a feeder pipeline from Cromer. What were your thoughts on Energy East back when it was first proposed? I was very, very hopeful for it. As you know, our government took the position of ‘all of the above’—we supported Keystone and we supported the pipelines to the West Coast because the differential had cost the treasury of Saskatchewan hundreds of millions of dollars. The differential would be reduced by anything that would get more oil to tidewater. Energy East was the top of my list for the reasons you mentioned. The capex (capital expenditure) that was going to result in Saskatchewan, especially in the southeast, in the Moosomin area, was massive. Also, there was a quantum of Saskatchewan oil that was going to be in the pipeline, so that’s obviously good for Saskatchewan. Also, I saw it as a nation-building project. I saw it as the modern-day railroad. We have the absurdity of us importing oil into central and eastern parts of the country, while we sit on the third-greatest reserves on Earth. It is just beyond understanding why a country like ours, with the resources we have, would not be energy independent or at least give itself the chance. I get that that pipeline was about export, too, but it leads us down the road to energy independence. You might remember in 2016 in the summer I went to speak at an energy conference in St. John, New Brunswick. New Brunswick was an ally and was supportive but I wanted to drop in on Premier Couillard in Quebec as well to build support, and when I was in St John, I went to the port facility and serendipitously there was a Saudi tanker unloading oil into Canada. It just underscored how nonsensical it is to be importing oil. Since two-thirds of Energy East is conversion, and one-third is new, it struck me that surely we can get this one done. Surely we can build this pipeline. I understand, and Premier Couillard pointed out, that most of the new construction and therefore the most controversial part of the pipeline was through his province and I understand that. But it was very frustrating then when the federal government changed the National Energy Board rules mid-stream and effectively killed the project. They can explain it away and say well, the proponent withdrew but everyone knows why the proponent withdrew—because they changed the rules. What was your reaction when TransCanada withdrew its application to the National Energy Board? I wasn’t surprised but I sure was frustrated, because the direct link was to the federal government’s decision to change the NEB evaluation rules in mid-stream, to require upstream and downstream emissions to be part of the assessment. No other industry faces that. No other industry has to account for upstream and downstream emissions. If they did that, what would happen to manufacturing, what would happen to . . . pick a sector. But they pick oil and gas and pipelines in particular. I was upset with the cause of that withdrawal and I believe it was the change by the federal government. Do you think a project like Energy East would still make sense for Canada, a project that would take Western oil and transport it to Eastern Canada? For the reasons we’ve talked about, for energy independence but also for the country to appropriately and responsibly develop the energy sector. We have this great resource and it’s essential that we develop it. I think what happened is when Kinder Morgan was hanging in the balance, the focus of Canadians bore down on this issue. I was pleased to see the polling improve as Canadians in other parts of the country realized, as they had a bit of a discussion and debate about pipelines and Canadian oil, what we’ve always known in the West—which is that if Canada doesn’t supply the oil, and energy demand is increasing through to 2050—and it is—someone else will supply it. How does that help the environment? It doesn’t and in fact it will probably be worse, because the oil will be supplied by countries that aren’t as mindful and responsible in developing the industry. If it’s not Canadian oil, it’s going to be someone else’s. When you look at Northern Gateway and Energy East, and Bill C-69, how would you characterize this government’s overall approach to pipelines? They’re obviously not big fans of the industry. I’m doing speeches now in my post-political time, and a clip I’ll often show is of the Principal Secretary to the Prime Minister, Gerald Butts, just before the Liberals came into government. He’s on the record as saying he doesn’t want to see any hydrocarbon industry in Canada by 2050. You had the Prime Minister’s Freudian slip at that town hall where he talked about phasing out the oilsands. They don’t particularly like the industry. I don’t know what other conclusion you can come to. When you consider the long list of policies, from the carbon tax to the unilateral methane reductions to the pipeline folly to NEB changes on Energy East, it’s not hard to line up the evidence with the notion that this government doesn’t like the oil and gas that Western Canada has to offer the world. What do you think is the main impediment to the development of new pipelines now. Is it simply C-69? If C-69 was gone, could some projects move forward, or is it more than that? I think it might be a bit more than that. As frustrating as that court decision was that caused a restart on complications on Kinder Morgan TMX (Trans Mountain), it answered the last few questions to some extent ie what is expected of a pipeline proponent to get it approved. That is the frustrating part about Bill C-69—after years of all of these court decisions and using the existing environmental impact assessment process, we now know what’s expected and now that we’re at that point, we’re going to throw that assessment process out and start with a new one that by every reasonable analysis will make it harder, if not impossible, to build a pipeline. How big of an issue do you think this is for Western Canada? How much of an effect do you think the lack of pipeline capacity has? A moderate gap between Brent and West Texas—never mind the additional discount for Western Canadian grade—has cost our government in Saskatchewan in the hundreds of millions of dollars for the government alone, and has cost the industry billions that could be otherwise reinvested in Saskatchewan or Alberta. It’s very, very significant. Very important. We need to be able to compete now with the U.S. who have a much bolder vision of energy independence and are there now and have pro-oil and gas development policies in place. We’re having to compete with them for investment and we’ve seen over the last year a billion dollars exit the Canadian energy sector not for another sector but for other energy sectors in other parts of the world, and that’s why I think you’ve seen a rise in western alienation. That’s part of it. What do you think the solution is? Is the solution simply greater pipeline capacity? Is there anything else the government needs to do to get energy products to market? Now that the federal government went full Venezuela and nationalized the Trans-Mountain pipeline, they need to get the expansion built and get things done, which is step one. Step two, they really need to pause or withdraw Bill C-69. Those would be two very good steps and the industry as a whole needs to be —and they have been working at this and I think it is improving—but they need to work even harder at the engagement with respect to First Nations. We’re starting to see a groundswell across the Prairies. We’re seeing a lot of convoys, a lot of demonstrations, a lot of protests. Do you think these will have an impact in the long term? Do you think these will have some impact at the national level? I think they’re positive, and I think it’s an important effort. I think they are very good because typically the energy sector hasn’t been one to protest. I think they realize that we’ve got professional paid protestors on the other side and the federal government doesn’t seem to be keen on the industry so we need to make a little noise and build support across the country. I think when Canadians turn on the news and they see these convoys or the size of the rallies that have been happening, I do think it helps. We have an election this year and it certainly can’t hurt—I’m sure it’s going to help a little bit. We’ve seen a federal government that would go ahead and buy a pipeline and decide to undertake the expansion itself—a federal government that appears to not really like the industry all that much. That tells you that people are having an impact and I just give everyone credit, the organizers and for people coming out I do think it is important. There is a local committee here that has been working to try to bring the pipeline issue to prominence again and working to try and do what they can. Any advice to them on where they should be directing their efforts? Go hard. Work hard at every opportunity. It’s not just a protest or a convoy, it’s everything together. Right now C-69 is in the Senate and the government leader in the Senate is Grant Mitchell, an Alberta Liberal but appointed as an “independent” senator. Flood his email. I just think that they have to take every point of leverage, and credit to people that are doing that sort of ‘all of the above’ approach. It’s individual emails and it’s media, and it’s protests and it’s convoys. It’s everything together. We have an election in October of this year and we should do whatever we can to bring common sense from the energy sector to that election.